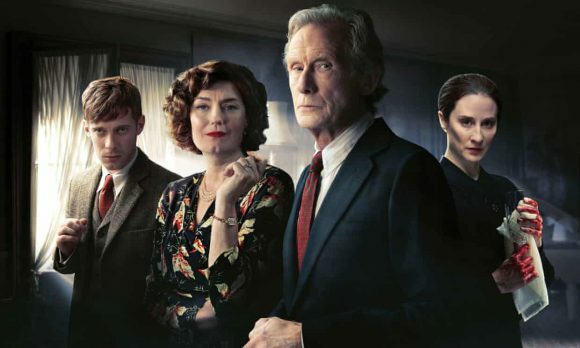 ☆☆☆☆ “The three-part BBC adaptation of the 1958 Agatha Christie novel is replete with stars, including Bill Nighy, Alice Eve, Matthew Goode, and Anna Chancellor. But it’s also curiously dark, stuffed with repetitive flashbacks, moody imagery, and nasty people committing acts of emotional torture. The surprise at the end isn’t that one of them is a murderer—it’s that the rest of them aren’t … Not quite the ordeal of the title, but not the enthralling mystery you might be wanting, either.” — The Atlantic. ☆☆☆☆ “Initially, it was ponderous and confusing, with time-hops and a wide cast of characters, including too many handsomely angsty brown-haired young men. Everyone had a signature flaw: morphine addiction, alcoholism, self-harm, terminal rudeness, wonky teeth. The Argylls were a damaged family, broiling with dark secrets … The pace steadily picked up and like so many Christie classics, it became a glorified game of Cluedo … By the end of the hour, this whodunit had its hooks into me.” — The Telegraph. ☆☆☆☆ “Sarah Phelps’ adaptation plays with the audience, slowly revealing pieces of the puzzle and toying with our expectations. The grand Argyll house at Sunny Point is certainly idyllic, with its trailing wisteria, sweeping staircases and rickety jetty over the water – but with each flashback to the kids’ troubled childhoods and to the night of the murder, the dark undercurrent is revealed.” — Radio Times. ☆☆☆☆ “The unexpected twist here, however, is that the three-episode period drama deviates from the book’s narrative yet still manages to weave an equally intriguing whodunit. Christie devotees may find the off-the-book story lines disrespectful to the beloved author — if not altogether blasphemous. But this series produced in the U.K. for BBC One does an artful job building out new puzzles atop the old while still honouring the work of Christie.” — Los Angeles Times. ☆☆☆☆ “Christie die-hards may bridle at Phelps ‘reimagining’ some of the detail, but with it she delivers luscious added depth. Christie perfected the art of the ‘soothing murder’: clean killings, characters cosily caricatured so we could enjoy the plot without too much emotional engagement. Phelps injects more humanity, psychodrama and menace into proceedings, adding layers of complexity.” — The Times.